A cracking whip sent the royal mail and passengers into the vast eucalypt-covered bush tracks of Australia. Cobb & Co operated their iconic coaches for seventy years from the gold rushes in 1854 until replaced by post-war motor vehicles in 1924. 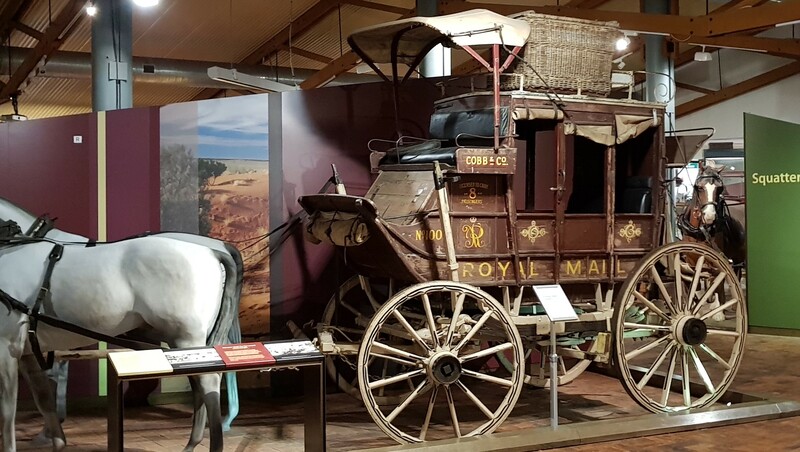 The ghosts of dubious tales told during hours of bumpy travel are brought alive at the National Carriage Collection of the Cobb & Co Museum in Toowoomba, Queensland, and I visited there this week. Greeting me was this handsome coach well over a century old and pictured above, built in Cobb’s factory at Charleville and operated in South Western Queensland until the 1920s. In 1963 it came out of retirement for the world’s longest coach journey, covering over 3,600 kilometres from far north Queensland to Victoria. The famous charitable drive was the brainchild of Bill Bolton MBE, the founder of the collection and for thirty years a director of Cobb & Co Transport. Next is a royal Landau which was the ultimate in passenger comfort. This one pictured here is the convertible model that carried Princess Alexandra on her visit to Queensland in 1959. That year was the centenary of Queensland, and representing the queen at the celebrations was her first cousin Alexandra, who was a very popular young member of the royal family. Around the corner is the innovative Drop Shaft Sulky. 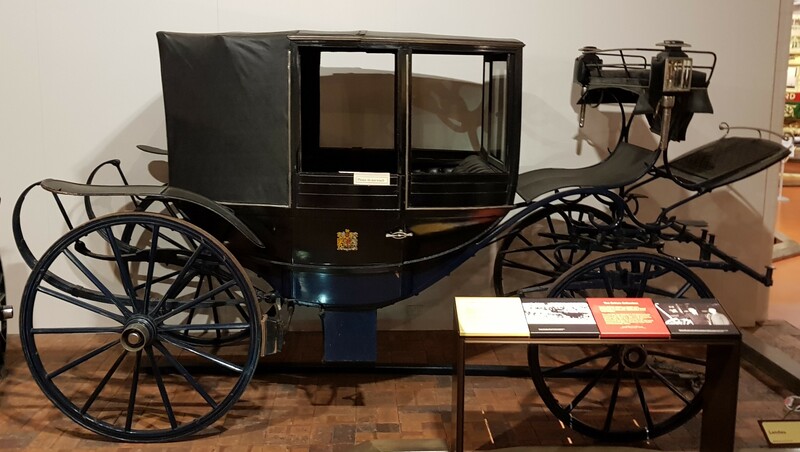 This was a Queensland invention that by the late 1890s was the most common horse-drawn passenger vehicle around. With a shaft that was bowed down beside the seat, it allowed for easier entry by ladies with their billowing dresses. It was also easy for men with wooden legs to swing their prosthesis up into the sulky, which was a useful feature back when amputation was more common before the discovery of penicillin. 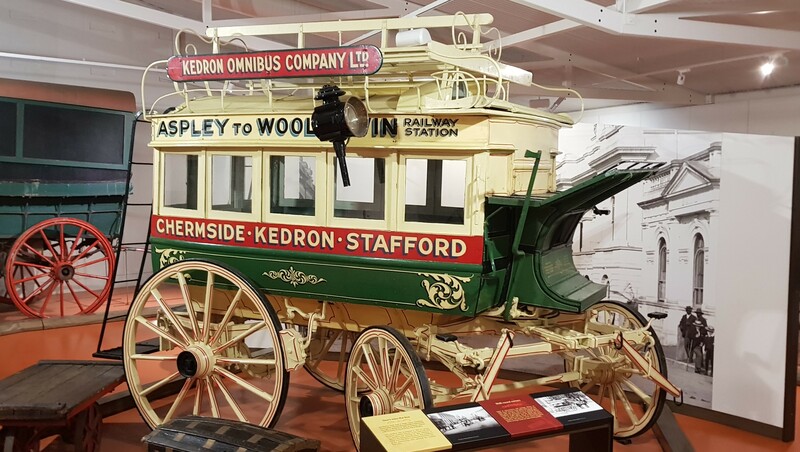 Beautifully painted is the Kedron Omnibus (pictured) built in Sydney in 1887 and brought north in 1893 by Mrs Leah Morton, an omnibus proprietor of Rosalie in Brisbane. It was licensed to carry twenty-five passengers including a dozen on the roof. ‘Ladies’ of course never sat on the roof. This omnibus operated in Brisbane for thirty-one years until 1924, when it was superseded by horse-drawn and electric trams. Mrs Morton was a regular in the newspapers for social events and legal action. The businesswoman passed away just four years before her omnibus followed suit. 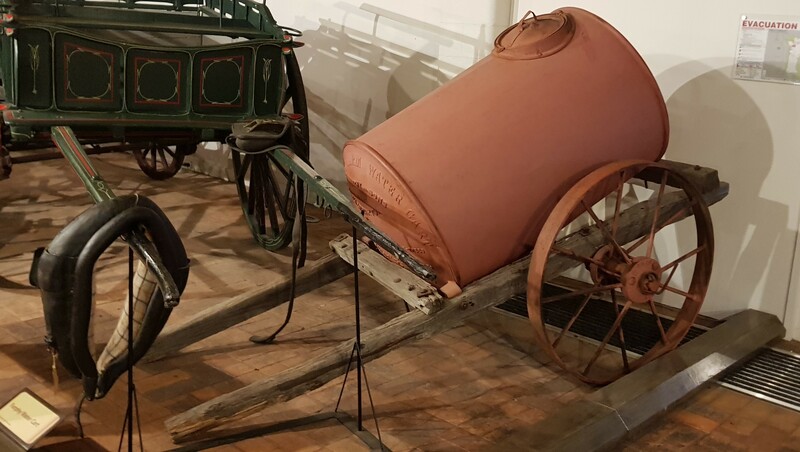 The Furphy horse drawn water cart (pictured) is a part of Australian folklore. It was invented and manufactured by John Furphy in Victoria between 1878 and 1880. John’s brother was a famous author who wrote the Australian classic bush novel ‘Such is Life’. Furphies were made famous by the scripting on the end plate, including “Good, better, best. Never let it rest till your good is better, and your better is best.” During the First World War, Furphies supplied the troops with water and their drivers supplied them with information gathered from other stops. The information was notoriously unreliable, so any piece of dubious information became known as a “Furphy”. The 154-year-old company is still manufacturing steel products to this day. The workhorse of the collection is a bullock dray built in Maitland in 1860 for Mr Alexander Wyndham of “Winton Station” via Goondiwindi. On the dray’s maiden six hundred kilometre journey to Goondiwindi, it was pulled by a team of up to twelve bullocks, taking several months. It carried supplies and large pots for boiling down horses, cattle and sheep, used to make the tallow for candles and soap. The station superintendent then was George Smith. In 1865, Smith was arrested for the murder of a shepherd, whose body was seen in a waterhole before disappearing. Aboriginal trackers followed a trail of grey hairs left as the body was dragged five miles into the bush and burned. Despite significant circumstantial evidence, Smith was mysteriously released by the colony’s attorney-general. The perpetrator was never brought to justice. Visit the Cobb & Co Museum, close your eyes and listen for the crack of the whip and the furphies being told. You’ll love it. Just finished reading it . Very good. However I thought that when referring to family name it should be spelt Furphys,also check superSeded, maybe should have a C. Otherwise perfect. 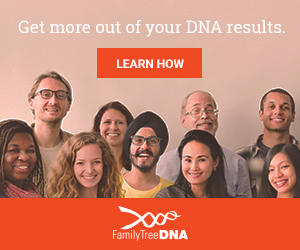 Harold, are you aware of the family connection? And this is no furphy. Margaret Scilley married George Furphy in 1898. Margaret Scilley was related to my mother, Phyllis, wife of John Beresford Barclay. The Sandgate dunny cart was welcomed until someone found the contractor washing his tins in the local lagoon. Where townspeople drew their water.